I have a thriving over-grown rhubarb plant in my garden and every year face the same challenges of finding ways to use these pink sticks. Rhubarb seems to really divide the crowd; a marmite type scenario where I often think of ways to disguise the fruit as much as I do to celebrate it. 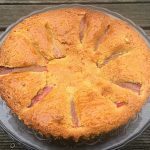 This recipe does both; the frangipane is so gooey and almondy and with the little crunch of the ginger biscuits, it does over shadow the rhubarb a little bit but every now and then you get that sharp hit of the fruit to balance out the sweetness. Pre-heat the oven to 180/160 fan and grease your tart tin with a little vegetable oil and line the bottom with parchment paper. Add the sugar and butter together in large bowl and beat with an electric whisk until light and fluffy. Stir in the orange zest, almonds, flour and baking powder and gently fold through. Add the ginger nut biscuit pieces and fold through. Add the mixture to the cake tin and level the top with the back of a spoon. Arrange the rhubarb sticks in a clock like fashion around the cake; pressing only slightly into the mixture as the mixture will rise up around them and you want the tops visible. Allow the cake to cool in the tin for 20 minutes. To make the glaze; melt the sugar, orange juice and orange blossom together in a heavy-based saucepan. Simmer on high for around 3 to 4 minutes until its reduced and syrupy. Glaze the cake with a pastry brush. allowing the syrup to sink in before adding more. When the cake is completely cool, remove from the tin (leaving the base on) and serve with creme fraiche whipped with some orange blossom or vanilla custard.